Grant Park Shopping Centre (Grant Park) came to us after updating their mall interior and procuring several new large tenants. Their goals were to communicate their values to patrons, and increase appeal among young professionals and families. 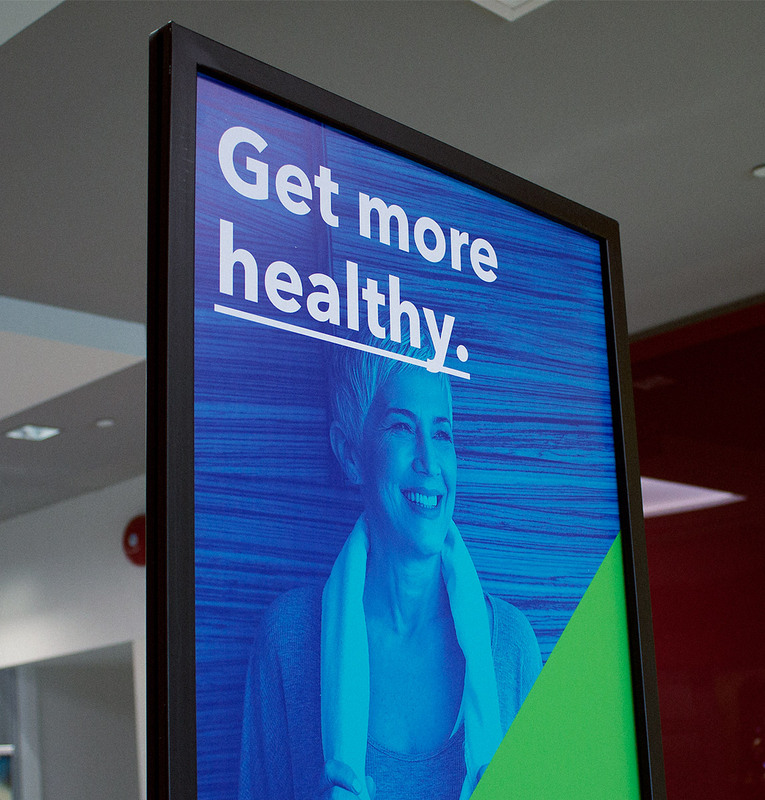 With new major tenants such as Canadian Tire, Winners, and Goodlife Fitness coming to the mall, Grant Park was looking to draw attention to its offerings that make the centre a staple for the surrounding community. To mark these significant additions, they wanted an updated identity and campaign theme that reflected the true essence of a modern mall. Before an analysis of the audience and the messaging could be carried out, Grant Park’s current identity needed to be assessed and updated. Due to recent significant renovations to the mall’s facade, several core aspects of the previous identity had to remain unchanged. A focus was placed on updating the current identity for digital application, with slight adjustments to the logo mark. Strict design guidelines were developed, which would allow Grant Park to be consistent with the application of their identity throughout the mall, and in advertising and promotional activity. Prior to working with us, Grant Park was using a mixture of earthy, outdated tones that failed to convey the excitement and growth happening inside the mall. To modernize their colour palette, we referenced portions of the new exterior and developed their bright green as their new primary colour. This would allow us to have one recurring colour with a strong association to the mall that had already been established. Grant Park has traditionally served a wide array of customers, with baby boomers and seniors being the most predominant demographics. 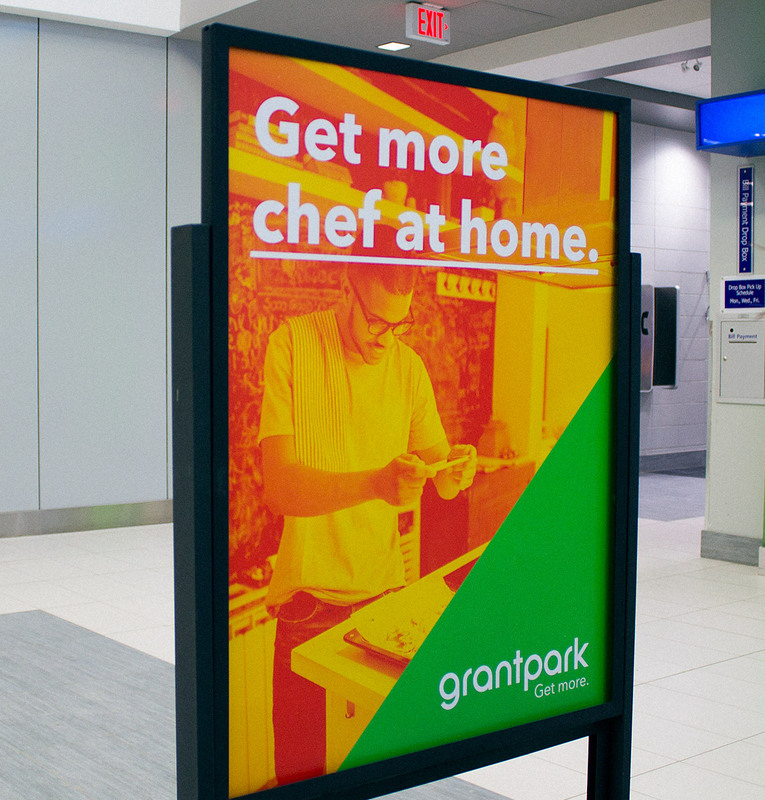 With their rebranding, Grant Park wanted to change the perception of being a “seniors’ mall”, or a hangout for young customers (due to their proximity to Grant Park High School and Pan Am Pool). The primary target was set as 24–35 year old professionals and families. These groups not only have above-average amounts of disposable income, but also value convenience and service over price. Upper-middle income, middle-aged and younger families living in urban and suburban communities. Lower-middle income, young singles and couples living in urban communities. Having identified our new target groups, and keeping Grant Park’s current patrons in mind, we began to gather insights in order to create a message that would resonate with all audiences. Grant Park is different from typical malls in that it doesn’t have a large suite of major clothing/fashion-based tenants. Based on our initial analysis, Grant Park hosts a collective group of shops and services that supplement the day-to-day life of its patrons: groceries and amenities, fitness facilities, electronics, specialty needs, and entertainment. With this roster of tenants, it became clear that there was an opportunity to position Grant Park with a value proposition unique from other malls. Unlike most shopping centres, Grant Park actually saves its patrons time – as opposed to being a destination where shoppers are encouraged to stay and spend a significant amount of time in the mall. In speaking to a number of locals within our target audience, we found that there are a lot of things people would like to do in their lives, but can’t necessarily find the time to accomplish. Grant Park allows those people to not only cover the basics, but gives them more of the time that they want for themselves. “Time” would serve as the key insight and foundation for the development of our approach and strategy for Grant Park. With its suite of utility-focused tenants, the essential value proposition of what Grant Park offers is time. By bringing essential and convenient shops and services together, Grant Park allows patrons to not only cover the basics, but also gives people the opportunity to save valuable time and get more out of life. It was critical that the messaging we developed would speak to our value proposition: time. However, we also needed to incorporate the tenants into the messaging, giving them a platform to communicate their value as part of the mall. The cornerstone of our messaging, “Get More”, was strong and flexible enough to accomplish just that. This phrase serves as both a declarative statement, as well as a call to action. It allows us to communicate the value proposition (get more time and get more out of life) but also contextualizes the sum of all of the services Grant Park has to offer. This paved the way to creating a sophisticated messaging system that, when paired with the context of an offering, utilized the tagline to create a unique message that spoke to our main value proposition. The power of this new positioning is its flexibility. An important idea to illustrate was that the sum of the mall’s parts are greater than any one alone. Grant Park gives everyone who touches the brand the moments in life that only time can buy. From here, we were ready to bring our messaging and identity work together, and begin to articulate the campaign. In order to bring the concept of “Get More” to life, we began by establishing an identity for the campaign that would sit comfortably next to the identity work that had already been set in place. A supplementary palette of bright, fun colours was created to help the branding stand out, and convey the positive message behind “Get More”. These colours were to be primarily used as an interesting way to treat the photos as a two-colour (or duotone) image. From this palette, colours were paired up and set in a guideline in order to avoid clashing and create recognition. The selected imagery heavily focused on lifestyle, with an emphasis on capturing people enjoying a moment of time well spent. Photography illustrated the value proposition, and communicated the benefits patrons gain from having access to the many resources Grant Park provides. With a finalized campaign concept and updated identity, we were ready to start developing assets that would bring “Get More” into the real world. An implementation plan was developed to roll out the campaign throughout the primary target area (PTA) and within the interior of the mall itself. To drive the new target audiences towards the mall, a focus was placed on generating awareness within the PTA. We developed materials and rolled out the campaign on billboards, digital billboards, and bus shelters throughout the PTA. 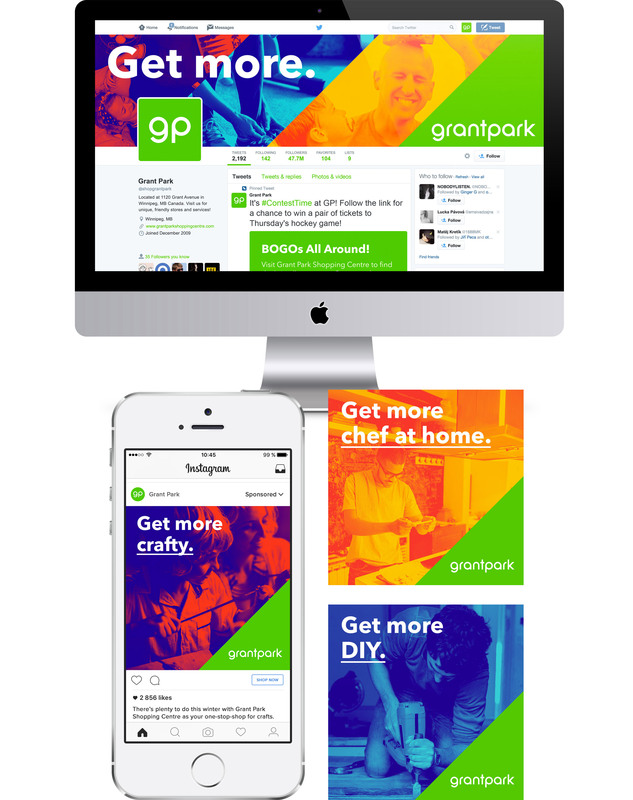 New social media assets were created and introduced across Grant Park's social media channels. In addition, we worked to develop micro-content schemas that would help Grant Park quickly create content with their internal resources, enabling them to be consistent in the use of their brand on social media. A series of custom assets were developed which were used throughout the interior space of the mall. 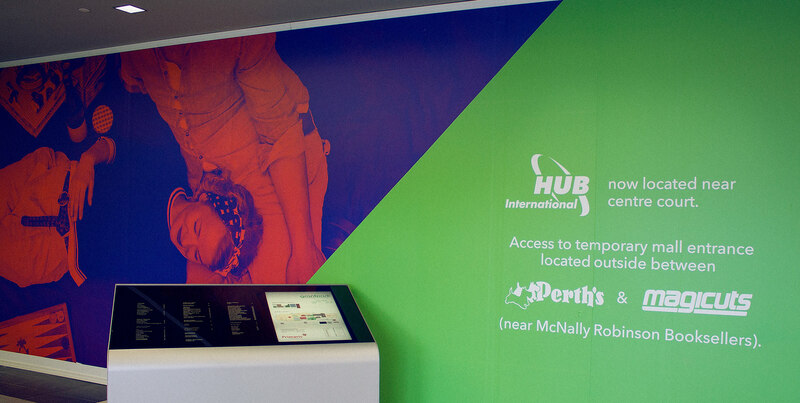 These included a large branded wall cover, door decals, show card holders, and various in-mall advertising assets. These added to the vibrancy of the mall and promoted the campaign to patrons while in the mall. 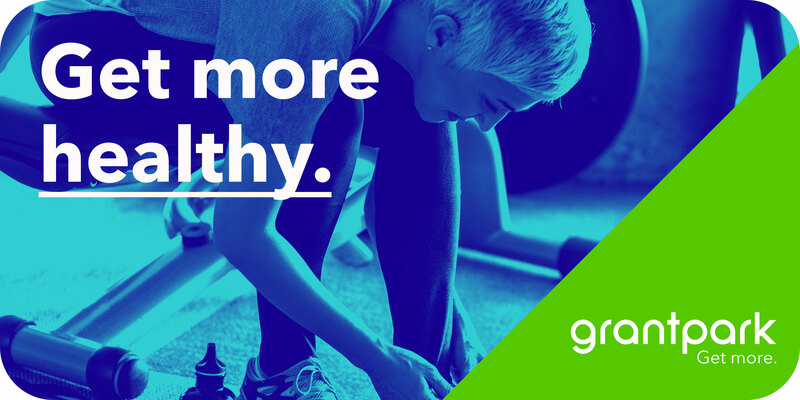 One of the standout features of the “Get More” campaign is its flexibility. It allows Grant Park to campaign in a variety of different ways. 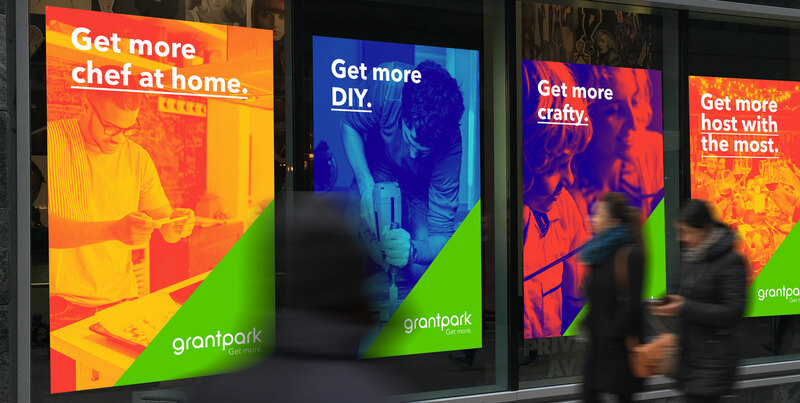 The campaign platform was created to serve as an ecosystem for interaction with the products and services of Grant Park’s tenants. We thoroughly considered how and where consumers would interact with the campaign, both online and offline. “Get More” was built to communicate the shopping experiences you can create at Grant Park, in a unique and dynamic way.